Screen size: 32", 43", 50", 55"
Create customised digital menu displays for your café, restaurant, bistro or fast food outlet with this network digital menu board and update them from anywhere in the world over your network, or via USB. 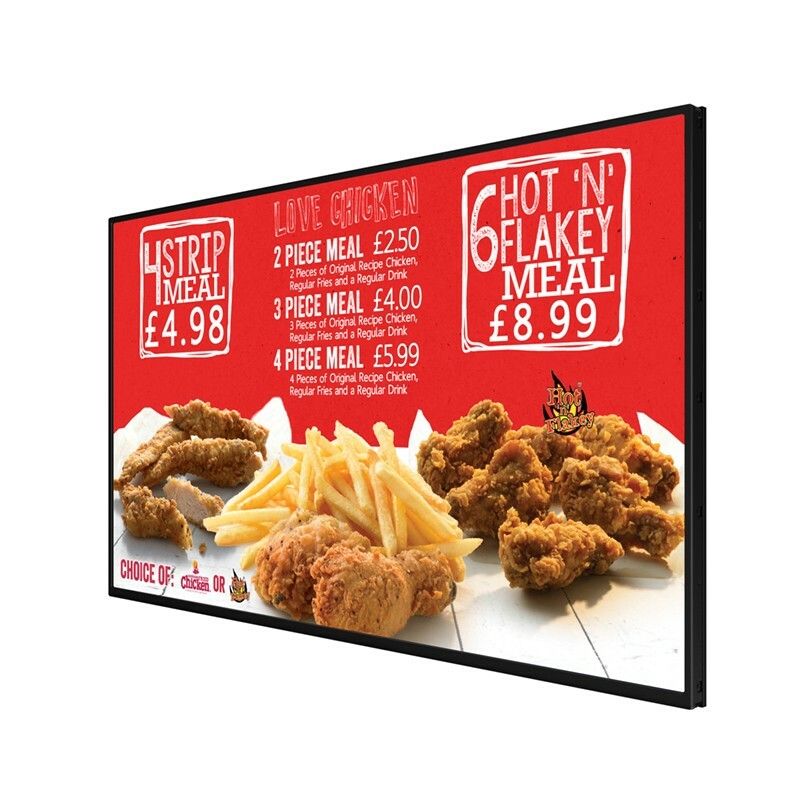 Offering a clear, highly visible and consistently branded display space, the convenient all-in-one solution includes a year’s free subscription to our online digital signage software, making it quick and easy to keep your messaging fresh and up to date. 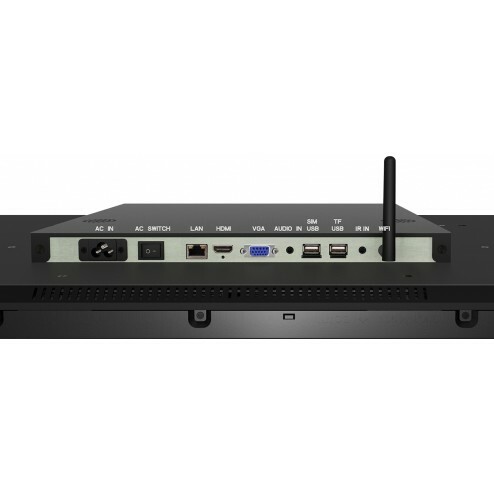 With an integrated android media player which allows for super fast updates, the networked advertising display allows you to connect the screen to the CMS wirelessly via integrated Wi-Fi or by LAN. Alternatively, if no internet access is available the screen can be updated with a plug and play USB option. Choose from a range of predesigned templates which can be customised with your branding, or create your own using static text, office documents, web pages, images and videos on a rolling loop, scrolling text and more. The commercial grade IPS panel provides superior image quality with an ultra wide viewing angle of 178˚. 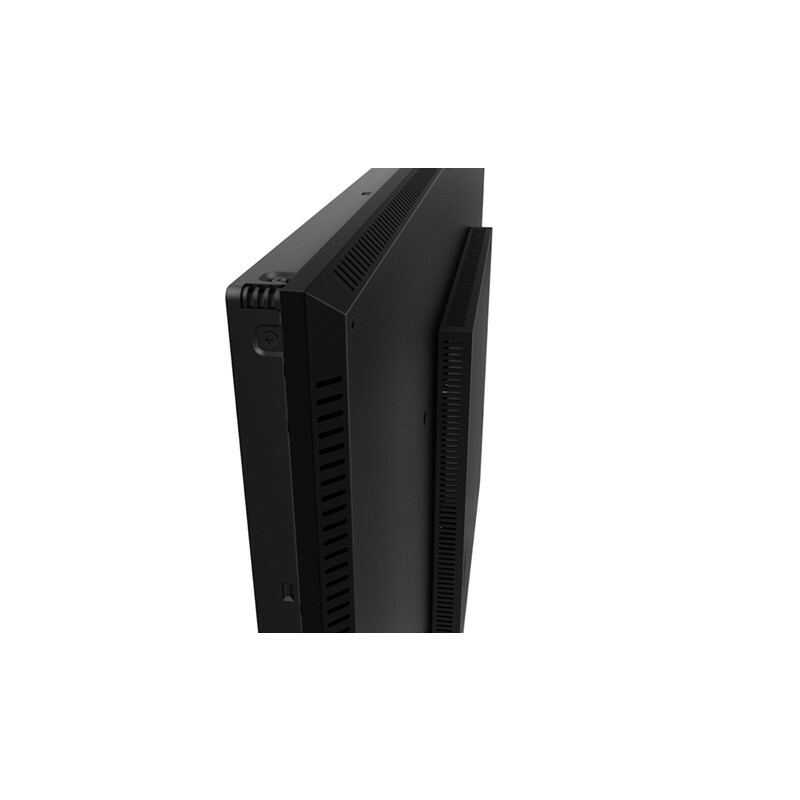 With twice the brightness of a domestic TV, the 450cd/m2 display maintains optimal colour during bright sunlight or challenging lighting environments, while advanced temperature control prevents overheating and an environmentally friendly power timer can be set to automatically power off in the hours that the display is not required. VESA holes ensure easy mounting in either portrait or landscape orientation, and the narrow bezel allows multiple boards to be placed side by side to create a near seamless display enabling multi-screen synchronicity as long as the screens are on the same network. Screens are available in four sizes from 32” to 55”. 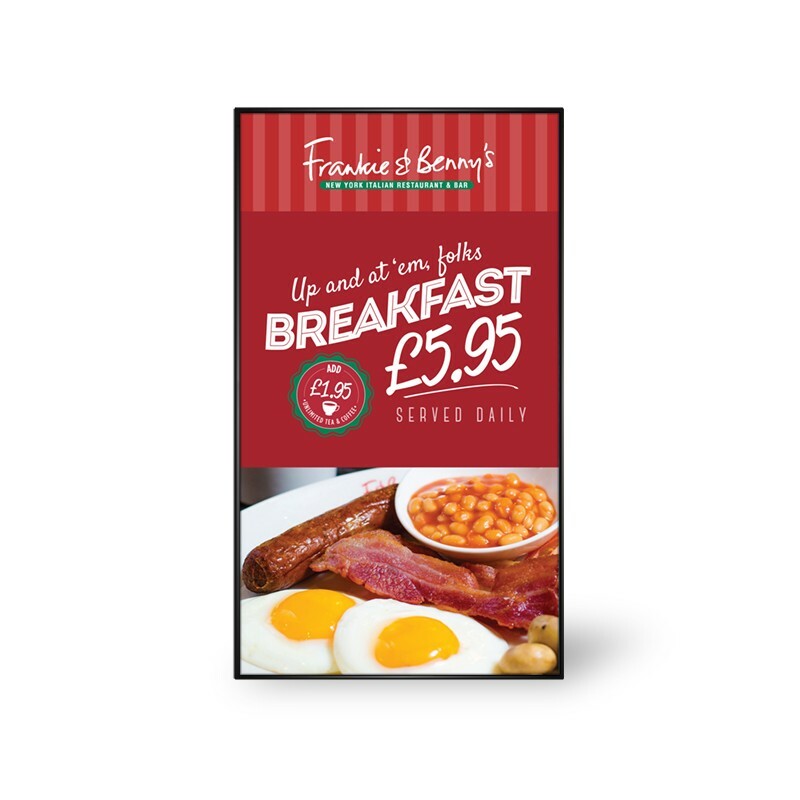 This stand can be quickly mounted using the VESA holes in many situations, either as a flat or tilted wall mount, ceiling mount or using a floor standing mount to suit your restaurant or food hall. If your screen does not have internet access don't worry the screens can still be updated using the plug and play system simply putting a memory stick in the back of the screen with the data on which will be transferred and shown on a continuous loop on your display. 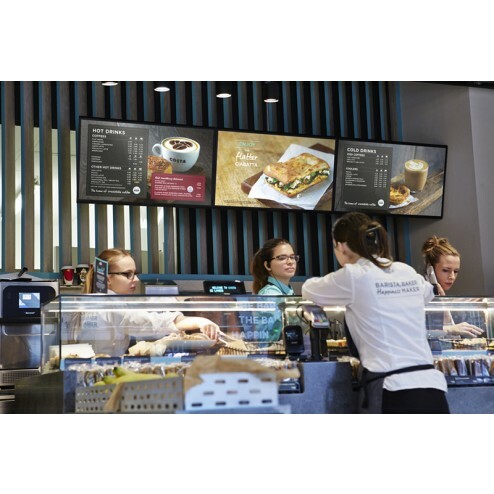 Upgrade your subscription to 2 years, 4 years or a lifetime subscription to the digital signage software to ensure your content is always current and unique to you. 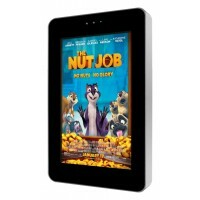 32" / 43" / 50" / 55"
You can use any of your own media files provided it is one of the supported file types. However with the purchase of this screen you gain access to a large digital library of template designs, allowing you to customise files, layouts, and playlists by using your own information; prices, brand, images, and videos. 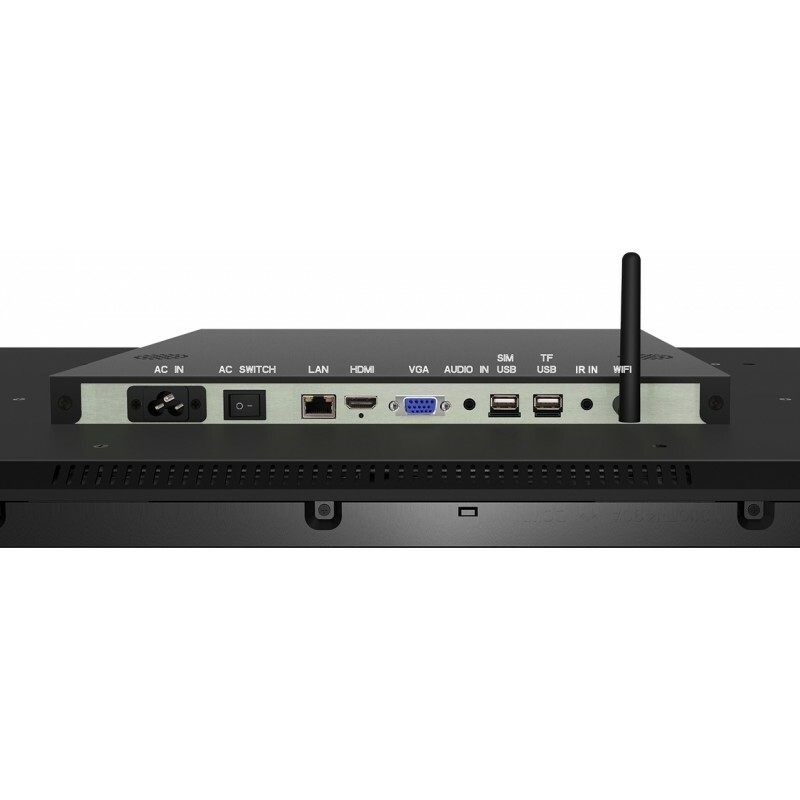 You may also use an external device to stream your media using either HDMI or VGA and a 3.5mm audio jack. If you would like help in creating visual information for, please contact us, we would love to help. 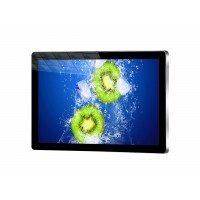 This screen is available in 4 different sizes; 32 inch, 43 inch, 50 inch, and 55 inches. Meaning there is a variety of sizes for you depending on your requirements. This is not a touchscreen display. How can I change the images displayed? You may update your screen’s media from anywhere and doing so instantly over the internet, just sign in to your MySignagePortal account allowing you to change the device’s media, create and update playlists. However if you find yourself without an internet connection, or just prefer to manually update your screen, you are able to do this via the Plug and Play Backup system. Just use a USB stick with your chosen files and playlists, insert, your content will copy to the screen and start playing. 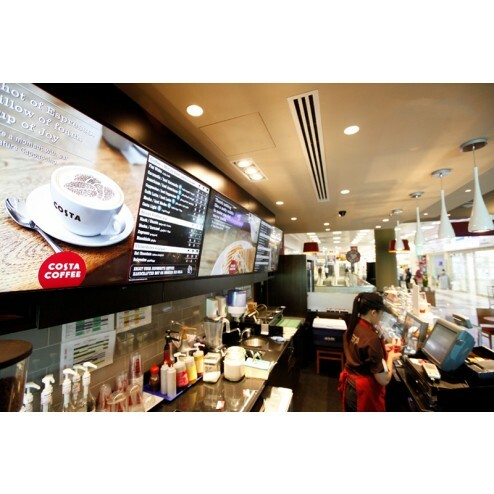 The screen has a resolution of 1920x1080 or 1080x1920 depending upon the installation. The LED backlight IPS display has a lifetime of over 70,000 hours under constant 24/7 use. Yes. This screen has 5W, 8Ω speakers (x2) on all models. How can this be mounted? Is a wall mount included? No mounting equipment is included with this product. Can I synchronise multiple screens to work together? Yes. You can make it so the the boards are synchronised so long as they are all connected to the same network, making it ideal for menus over the counter, and even displaying one image across multiple screens with it’s thin bezel design. Can you get the schedule changed? You may change the schedule with the Cloud-based Content Management System (CMS) from anywhere where you have access to the internet through the MySignagePortal, allowing you to set up on/off times, change volume depending on the media, and schedule menu changes depending on the time of day. This can also be done using the Plug and Play system with a USB stick. The MySignagePortal CMS Subscription allows you to take full control over the screen, changing media on the device, creating playlists, or altering the timings details of your current playlist, enabling you to ensure the display matches exactly what you need it for. This can be done so long as you have access to the internet. Another feature of this is the access to the extensive template library available making setting up your screen that much easier. This screen comes with a completely free 1 year software license, allowing you to benefit from the features available through the subscription. You can also buy extended warranties for the screen, we offer 3 years, and lifetime. Although should you wish for a more customised plan, please feel free to contact us, we would love to help you.